This was posted on March 1, 2011 by Teri Maxwell. We are continuing a series of articles inspired by a comment that was made in response to this blog post that we had on our Titus2.com blog. Here is the post if you care to refresh your memory, and the comment follows. In this article, I would like to move into the realm of whether or not chores are important for a child. I had planned to address this topic as the series continued, but the responses to the first two articles were quite articulate. They provide other voices and other experiences beyond my own so I will start with what some of them shared with me. “The first thought that came to my mind when I read that negative blog comment was, don’t future lawyers and astronauts need to learn how to do dishes, too? Don’t they need to learn the values of hard work, self-discipline, or consistency? “People these days are continuing to lie to themselves if they think that having a ‘carefree (irresponsible, child-centered) childhood’ really develops good leaders and professional workers. My husband is a professional engineer with a tremendous amount of responsibility and many employees. He handles vast amounts of taxpayer money every year. He is a rare find, as he takes this responsibility very seriously, and invests enormous amounts of time to make sure he is making the best possible decision for all of his fellow citizens affected. “Notably, in the past two years, he has hired about seven new employees . . . five of whom were RETIRED professionals. He has had to find older men who take pride in their work, because there are no younger men with the expertise or work ethic he requires. The other two new hires did NOT have college degrees, but were men who expect to work hard to earn a living and respect authority . . . rare qualities these days. I bet all of these people had chores to do as children! “Interestingly enough, it is my husband, the ‘professional’ who most often cleans the pots and pans after dinner for me. It is an expression of his love for me and takes one thing off of my never-ending list of things to do, as a stay-at-home mother of five young children. I would agree with these ladies who wrote to me. 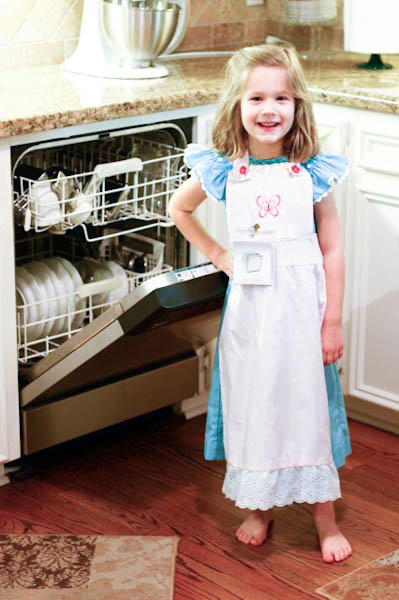 Our children need to learn to do chores in our homes because these will be skills they will be using throughout their lives in whatever capacity God calls them to. “It is good for a man that he bear the yoke in his youth” (Lamentations 3:27). Helping with household chores is really not even a very big yoke to be born. I want my children prepared for their adult lives and to look back on their childhood with gratitude for that preparation. May I encourage you not to let the world convince you that work is harmful for your children but rather to evaluate the reality of life and set them on a path toward success. Next month we will continue our discussion with more about the importance of teaching our children.